Well, after yesterday when our heads had dropped a bit low today could not have been more of a contrast….. The ride, another 250 miles today went smoothly. There was still some residual winds, at first head on again, but later in the day they switched around to our rear and pushed us along instead. The weather cleared and the day became warmer, and with the rising celsius we found our spirits rising again. Maybe that’s all we needed, a bit of sun to make us smile again. We arrived in Gaiman around 3.30pm. Gaiman is a town that was settled in the late 1800’s by Welsh people. Their Welsh traditions and architecture have been preserved to this day, and the town is a wonderful thing to see with it’s Welsh flags, and welsh names everywhere. The town is peppered with tea rooms. We are staying at Gwesty Plas y Coed, a Welsh tea room with rooms. Of course Paul was desperate to try out the tea, and had a wonderful plate of Welsh cake, fruit cake, scones, sandwiches, drop scones, custard tart- all very tasty. 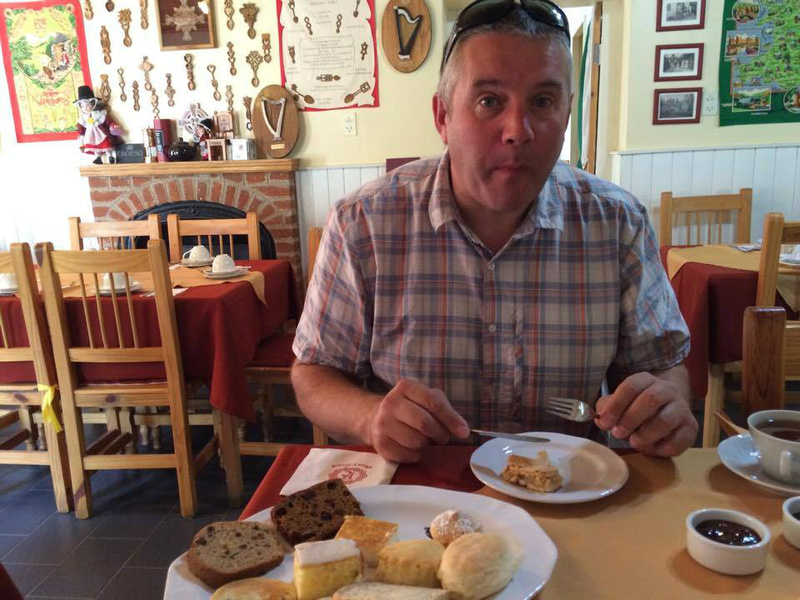 The wonderful thing here at the tea rooms is that the owner is Spanish, but speaks excellent English in a Welsh accent! She is passionate about Wales and has visited 5 times. The tea rooms are decorated in everything conceivably Welsh you could think of. We visited the museum in the town and a railway tunnel that has been turned into a museum. The guide was very interesting and conveyed a passion for his town, which he says everyone who lives here has. Tonight we have made an arrangement to meet Dakar Motos at Buenos Aires airport on Monday to begin the process for the air freighting of our bike, which will take 4 days. We have also booked our own flights, and will definitely be back in Blighty on Sunday 19th February! Not long into our journey today, the wind blew our souls straight out of our bodies and then tormented us all day with a pretty continuous headwind. The result was a spectacularly difficult day, resulting in ringing ears, and aching bodies. We didn’t even manage to break the difficulties by raising a laugh with each other. But hey ho, we always knew the run up to Buenos Aires from Ushuaia was going to be a tough one because a) our destination was always Ushuaia, the end of the world and b) We’ve already ridden 900 miles of the route going South, and therefore knew that the road runs through a large expanse of nothing, populated only by six towns alongside the road. The rest is barren, volcanic lands with a smattering of Rhea birds and Guanacos. Oh ys, and we saw a very small armadillo crossing the road today. This means that we really must dig very deep for self-motivation to keep going, when we feel like the trip is over, but there is still a long way to go. Over the months we have talked of various ways to deal with this inevitable ‘final run’, taking a different route back, finding attractions or places of interest to visit, and even taking a four week cargo boat home, which is a cost effective possibility for us. But no, we always suspected and it appears to be proving to be right, that once you feel like you’re done, you just want to head home as quickly as possible. With just 10 kilometres to go today we were stopped at a Police check and asked to show our passports, for the second time in two days. For the previous four weeks in Argentina, we’ve always been waved on through, but I guess that’s just the way it goes. We are now ensconced in our apartment, a lovely modern little place, and I’ll be cooking up a storm of rice and tuna shortly. I think a bit of tv and early to bed is in order, before hopefully waking refreshed and raring to go again tomorrow. Leaving alone this morning felt a bit strange after having ridden and been with Patrick for quite a while. We missed his French craziness today! He’s a day ahead of us now, so we may not cross paths again until we reach Buenos Aires, where we shall both be trying to arrange air freight for our bikes. Along the way today we stopped at an area that was a succession of extinct volcanoes, which was very interesting. Apparently at the area’s deepest point, it is 107 metres below sea level- the lowest point in Argentina, and the 7th lowest point in the world. As you can imagine the land was very barren. Patrick hasn’t forgotten us though, as when we arrived at the hotel this afternoon (the same one as on our way down to Ushuaia), the owner informed us that Patrick had paid for two drinks behind the bar for us tonight- what a great guy. Troy and Tracy should be arriving in Ushuaia today, and will hopefully be enjoying the euphoria of reaching the end of the road, just as we were this time last week. Quite a few of the motorcycle travellers that we have either met, or been in touch with during our time travelling, are nearing, or have reached Ushuaia recently, although in contrast there are several that are still way back in Guatemala, or Nicaragua in Central America! It’s so interesting, the various ways that people plan and enjoy their journies. How one person’s idyllic end to the day is to pull off the road, find a great spot and wild camp, whilst watching the sun going down and drinking tea- and another’s is to ensure a hot shower, warm food and maybe getting some laundry clean. We talk regularly with other travellers about how there is no right or wrong way to make your trip, how there should be no regrets, your trip is your trip. In these days of social media, it can be very easy, particularly if our day has been difficult to think ‘oh, those people are having the time of their lives- why didn’t we go there’, but it’s been great to find out that in reality, each one of us faces the same challenges, be it the weather,the endless border crossings, the changes of culture, the language barrier, finding food to suit you, getting used to the ever changing currency and exchange rates. It would appear that just like for us, for everyone else as well, some days these things are not a problem, and some they seem like an insurmountable hurdle. All part of travelling and adapting. No, we wouldn’t change a thing, not even Paul being ill, as it taught us the utter kindness of strangers, in lands where people in the next country will tell you- ‘they’re bad- they’ll steal all your money’. We never found a grain of truth in this anywhere. As you can probably tell, this is becoming a time for reflection, at last a time to think about a fraction of what we’ve done, and seen. The three of us (Paul, Patrick and I) left early yesterday morning. 8am sharp, in the cold. We were hoping for a repeat of last week, where the long day with two border crossings, popping back into Chile, a ferry and Ripio roads went as smoothly as possible. It wasn’t far to the first border, just 40 miles or so, and after a quick refuel, we were soon standing outside Argentinian customs with our exit stamps, and the first part of the procedure done. The second part was just as swift, in the Chilean side, just 10 miles down the gravel road. Patrick especially had not been looking forward to the repeat performance of riding the gravel, so he went ahead to go at his own pace. His own pace turned out to be pretty fast! As he pulled off his helmet at the Chilean customs he said- ‘it was ok’. Well that’s good as there was still another 25 miles to go, through the road construction. As we waited, one of the YPF (petrol) tanker drivers came over and asked me a few questions about the bike. By this point in the day we had probably overtaken him twice already, so he’d had a good chance to have a look at us. He carried on the conversation with Paul, when he returned from customs, before we overtook him one last time before setting off onto the gravel section. Once again Patrick went in front and set his pace. It was nowhere near as windy as last week, which certainly helped. It was ok, as good as it could be, but oh boy, it’s certainly a lot nicer when you get back to the lovely smooth stuff. We stopped immediately at the end of the gravel, to catch our breaths and have a moan! The journey continued through Chile for another 85 miles, before landing us back at the end of the road, where the only way to the other side is by taking the ferry. We had been a little concerned about this part, as last week when we crossed there was a huge queue waiting to cross back to Argentina. This time we were lucky, there was only 5 cars and a lorry full of smelly sheep, or so we thought! There was a ferry coming in, so there was just time for a quick biscuit before getting back onto/into the bikes for loading. We then sat there like fools, as a huge stream of petrol tankers, including our new mate, came from around the corner (they had been hiding out of view! ), and filled up the ferry, before sailing off into the distance. We leapt off the bikes, had another biscuit, and then, miraculously, another empty ferry arrived. This time we could get on, or could we? Paul turned on the ignition, and ………… nothing, no electronics! We still got on that ferry with a combination of rolling down to the slope, then leaping off and pushing the sidecar up the ramp and onto the deck. The crossing was a lot smoother (and warmer) this time, and Paul and I went up on decks to see where we were going and had the pleasure of viewing a few Hector’s dolphins. They are native to the area, and are tiny. The crossing takes 20 minutes, so before long we were running down the ramp pushing the bike off the other side. We both had a feeling that we knew the problem, probably a loose battery terminal again, the same as had happened in Nicaragua. Fingers crossed anyway. I think we quite impressed Patrick by getting on with the process of tank cover removal, checking the battery, and having a quick check of the bikes on board brain with our diagnostic computer tool. It was just a loose terminal, so in no time at all Paul had it tightened, and everything packed away, whilst Patrick enjoyed his Cafe au lait. So, with three of the day’s four hurdles already dealt with and it not even 2pm, we were all in good spirits. Before too long, the last hurdle was also out of the way. Hopefully what will be our last border crossing until we leave Argentina in a couple of weeks time. 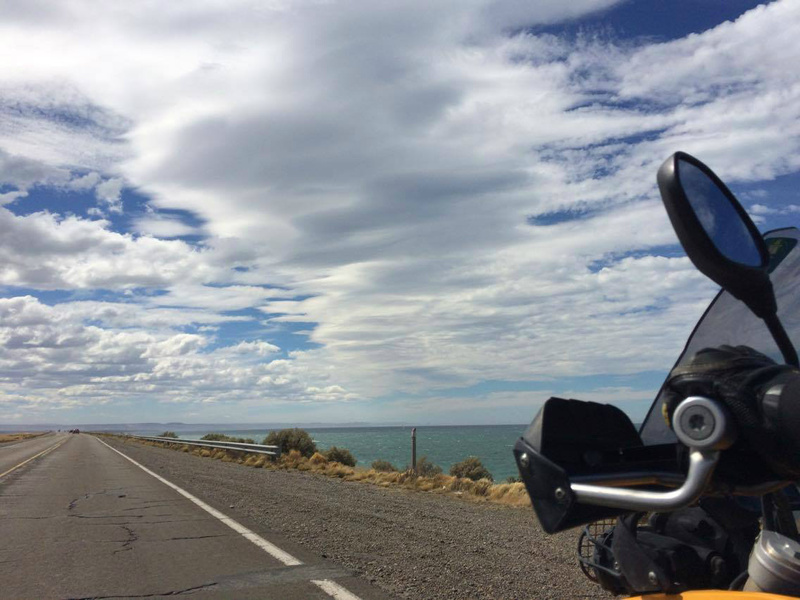 The ride back in to Rio Gallegos was smooth and quick, and we were happy to see the Brazilian motorcyclist who we have seen most days over the last week, was already at our hotel. 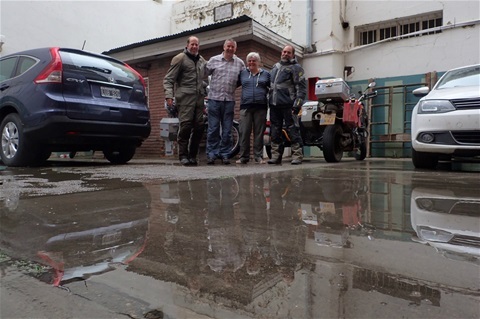 We went around to the parking behind the hotel, got off, and started to unpack, before Paul said ‘listen’, and our great friends Tracy and Troy turned into the car park! 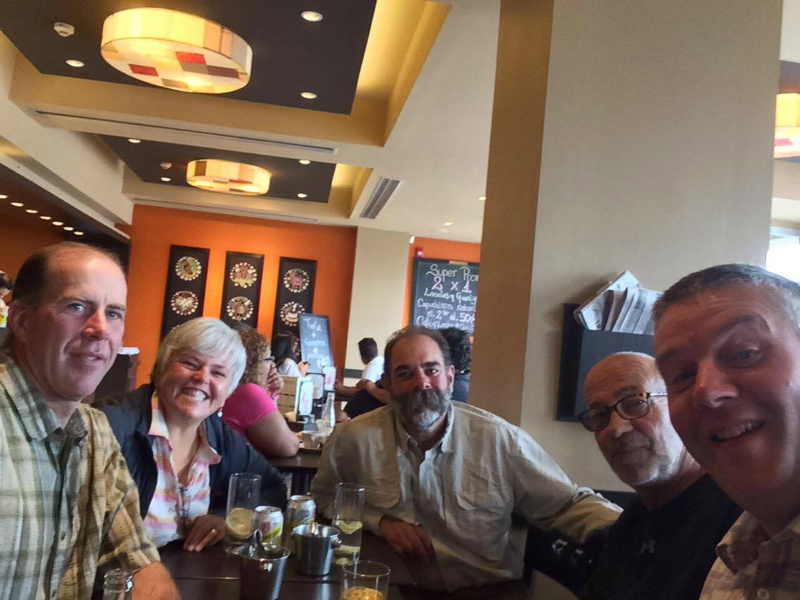 Troy and Tracy are still making their way to Ushuaia, and although in Chile just two days ago, had managed to find time to come and see us, for one last time. We had a great evening with the five of us, talking about our adventures and making plans for the future. We said a fairly tearful goodbye to those great guys this morning, we wish them all the best for their onward journey, and can’t wait to see them again in Alaska, or the UK! Patrick has headed off northward, whilst we opted to stay another night. No doubt we will meet again in a few days, as our route and destination is the same. Things are becoming very real, we are in talks with the freight company about flying the bike home, and have a provisional date of Sunday 19th February for being back in the UK…………….better get our thermals on! The last three days we have spent exploring Ushuaia, and reflecting on our ride to here, before starting the long 2,000 mile haul back up through Argentina. We’re guessing the return journey on the same roads may be a little more tricky without the momentum of euphoria to keep us going. Ushuaia turned out to not be quite as cold as we had imagined. In fact, rather like a mild winter’s day at home (although it is of course summer here in Ushuaia), with blue skies a crisp feel to the air. There are many visitors to the city all year around, it is a cruise liner destination, and during our three days, we saw three visiting cruise ships. For attractions there is the possibility of taking the train to the end of the world, or visiting the end of the most southerly road in the world (as we did). There is hiking in the snow topped mountains, for miles around, or a visit to the national park full of lakes, walks and hikes to view animals. People also visit in order to board cruise ships bound for Antarctica, crossing the notoriously rough Drake passage. There is also the chance of visiting islands with penguin colonies, which is exactly what Patrick and Paul did yesterday. It had been Patrick’s dream and motivation for his trip, to see a penguin in its natural environment, and Paul and he took off in a helicopter yesterday, visiting Estancia Harberton, then heading off in an inflatable boat to Martillo Island where they saw thousands of penguins! 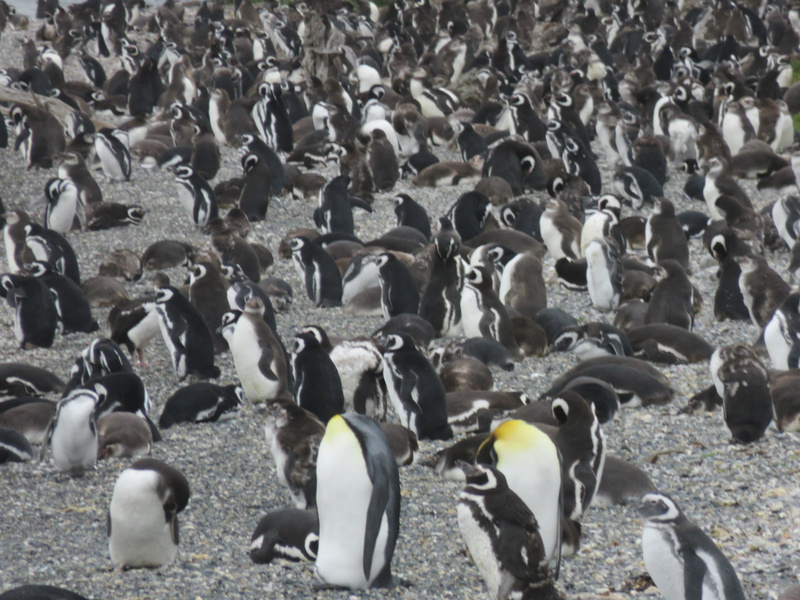 There were two visiting King Penguins, and scores of nesting Magellan and Gentoo penguins. They described it as noisy, and fascinating. The Magellan birds live and nest in burrows, and the Gentoo create a ring of stones to keep their eggs safe. On the return flight they flew over a shipwreck of a passenger boat from 1928, which used to run to Buenos Aires, and had good views of the city of Ushuaia. Today we have returned to the town of Rio Grande, where the temperature is considerably warmer, and the wind a lot stronger again!